Resolute Energy has had a great run over the past 12 months. Can Hi-Crush Partners, Whiting Petroleum, or Clean Energy Fuels replicate that success this year? Just about any oil and gas company with acreage in the Permian Basin -- no matter its size or financial standing -- is among the hottest energy stocks as of late. Case in point: Resolute Energy (NYSE:REN). The economics of drilling in the Permian are so superior to any other place that Resolute was able to grow production 82% in 2016; those numbers have fueled an astounding 1,340% gain in its stock price over the past year. 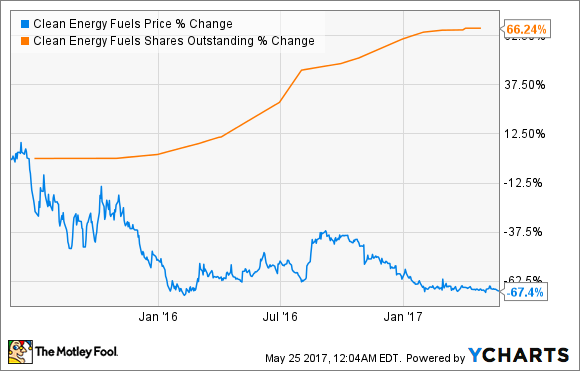 It's hard foreseeing Resolute Energy -- or any other stock for that matter -- achieving a repeat of that performance this year. In the spirit of looking for this explosive growth in stocks in the energy sector, though, we asked three of our contributors to pick energy stocks that have a chance of major growth. Here's why they picked Hi-Crush Partners (NYSE:HCLP), Whiting Petroleum (NYSE:WLL), and Clean Energy Fuels (NASDAQ:CLNE). Tyler Crowe (Hi-Crush Partners): One thing that has allowed the second wave of shale drilling to take place over the past year is that producers have become much better at tapping shale reservoirs. Better techniques, more efficient operations, and a more thorough understanding of the underlying geology have transformed a resource once considered a marginal-cost player to one of the lowest-cost sources out there. For Hi-Crush, that means it will be able to run all of its sand mines at full capacity, which it expects to achieve in the third quarter of this year. On top of that, the fixed-cost nature of operating sand mines means each additional ton brought back online will result in a higher sales margin. But the company isn't done. It recently acquired the rights to land in the heart of the Permian Basin it plans to turn into a 3-million-ton-per-year sand mine, and it is spending heavily on its logistics and last-mile delivery services. These are all things that should significantly boost the bottom line and allow the company to restart its distributions to shareholders -- it is a master limited partnership, after all. For all the talk about the growth of oil production, the growth of frack sand is an even more incredible trend happening right now. For investors looking to play this trend, Hi-Crush could be an interesting pick if management can execute on these growth initiatives. Matt DiLallo (Whiting Petroleum): Among the fuels behind Resolute Energy's stunning rebound over the past year have been its efforts to improve its balance sheet. These initiatives have included non-core asset sales and equity issues, which have combined to reduce enough debt that the company can now redirect cash flow toward drilling high-return wells in the Permian Basin. It's similar to the path taken by leading Bakken Shale driller Whiting Petroleum. Over the past year, the company sold several non-core assets, including its enhanced oil properties in Texas and its midstream assets in North Dakota, while also completing two convertible debt exchanges. Add it up, and the net result of these initiatives is a 42% reduction in debt over the past year. Thanks to that balance-sheet improvement, and a little help from higher oil prices, Whiting Petroleum is starting to turn its production profile around. Given its current projections, the company expects output to increase 23% by the end of this year. That's a remarkable turn for a company that endured a more than 20% drop in production last year due to underinvestment and those asset sales. However, despite the balance-sheet progress and noticeable improvement in its results, Whiting's stock is down 21% over the past year. It's a decline that could quickly reverse this year once Whiting's production and cash flow start turning a corner, with Resolute-like returns not out of the question. As the chart above shows, Clean Energy's stock price has fallen by two-thirds over the past two years, while management has issued a ton of new shares. This has resulted in the market largely ignoring the positive improvements in the company's business over that time. For years, Clean Energy has been able to steadily grow fuel volumes at double-digit or near-double-digit rates, even with low diesel and gasoline prices reducing the financial benefit of vehicle-fleet operators switching to natural-gas vehicles. At the same time, management has steadily squeezed operations, driving out costs and leveraging better results from a smaller amount of selling, general and administrative expense. The company has also backed down on capital growth spending, helping the company generate positive cash flows over the past year. And all those new shares? Management had little choice but to issue them, in order to pay down a significant amount of debt due in mid-2016. While this has been a painful experience for current shareholders, the company's debt is down more than half, and on track to fall another $100 million or more before the end of the year. Looking forward, Clean Energy is positioned to start delivering per-share growth. Eventually, the market should catch on, and when it does, investors could see very big returns.